How do I set up SafeZones? 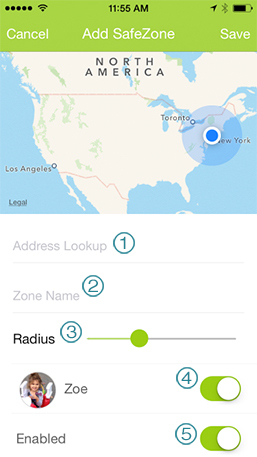 Within the smartphone app there is a simple setup function, which allows you to create a SafeZone. Up to five SafeZones can be stored/activated. 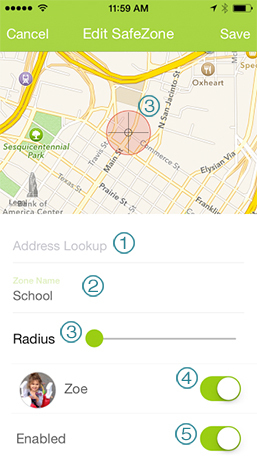 When a FiLIP “Enters” or “Exits” these locations the parent receives a notification from their FiLIP app. 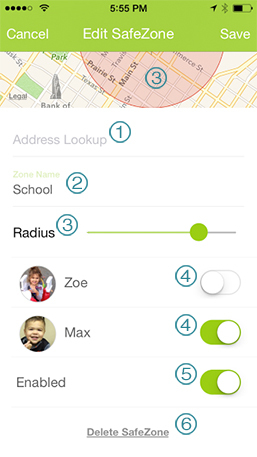 To create a SafeZone, simply add the address where your child (and FiLIP) is supposed to be at any given time. Note: Remember, you can set up multiple SafeZones (i.e. “home” and “school”) and just turn them on when needed. Name your SafeZone. You can create and store up to 5 SafeZones. Use the slider to determine the radius of your SafeZone. The red radius circle will automatically expand or shrink depending on where you place the slider. Slide this on to enable the current SafeZone for your child. Slide this on if you’d like to activate a SafeZone and receive notifications alerting you when your child (and FiLIP) has entered or exited a SafeZone. Select this option to delete the SafeZone. What do the various options in the watch settings mean?